So happy that today Free Kindle Books and Tips is featuring Thieving Forest! I’m also hosting a year-end giveaway. I’ll pick five winners for either a paperback or audiobook version of Thieving Forest on December 15th. 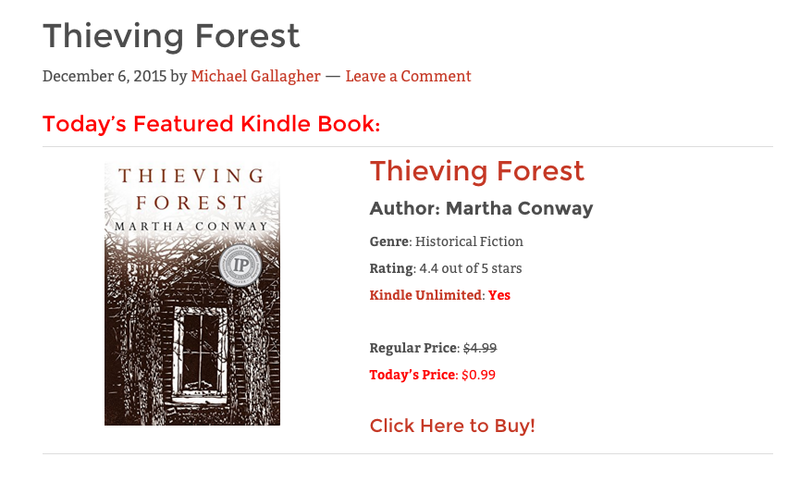 Martha Conway’s new novel, Thieving Forest, won the North American Book Award in Historical Fiction and a Silver Medal in Historical Fiction in the Independent Publishers Awards, and her first novel was nominated for an Edgar Award. Her short stories have appeared in The Iowa Review, The Massachusetts Review, The Carolina Quarterly, Folio, and other journals. She teaches creative writing at Stanford University’s Online Writer’s Studio and UC Berkeley Extension.